What is energy equality? Energy equality refers to equal rates for energy sources across the United States. These energy sources include electricity and natural gas. What we are experiencing is energy inequality. The price for energy is gravely unequal across the United States, and it is not related to the cost of producing the energy, but rather lack of means to produce it. This is a prevalent issue, especially for those considering relocating to a new state. Photo sourced from: U.S. Energy Information Administration (eia.gov). 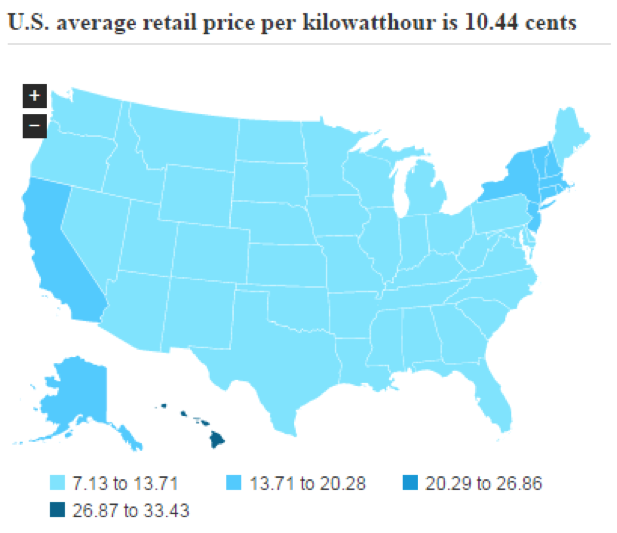 A couple of cents extra per kWh does not seem like it is enough to make a substantial impact on household budgets. However, every 5₵ adds about $600.00 to annual household electricity costs (Petrowski, 39.) This is something to largely consider in cost of living. Energy rate inequality is an issue that is not spoken about often, but it is a problem that our nation faces. If you are considering moving to a different state, something to keep in mind and perhaps budget for would be overall energy costs that vary across the Nation. "Average Residential Price." Average Residential Price. N.p., n.d. Web. 20 Dec. 2016. "Factors Affecting Electricity Prices." Factors Affecting Electricity Prices - Energy Explained, Your Guide To Understanding Energy - Energy Information Administration. N.p., n.d. Web. 20 Dec. 2016. Petrowski, Joe. "Equality in Energy." Independent Gasoline Marketing Nov. 2016: 39 . Print. "U.S. Energy Information Administration - EIA - Independent Statistics and Analysis." Heating fuel choice shows electricity and natural gas roughly equal in newer homes - Today in Energy - U.S. Energy Information Administration (EIA). N.p., 24 Aug. 2012. Web. 20 Dec. 2016.